Processing payroll is a key responsibility for your business if you have employees. You may be starting a business, having hired your first employee, or you are considering having employees and wondering what's involved with this payroll process. 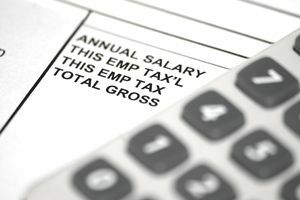 As you weigh the options for processing payroll and dealing with payroll taxes, you might find it helpful to consider the tasks involved in processing employee payroll and in paying and reporting payroll taxes. For this discussion, assume that all of your employees are regular and not independent contractors. And paying those taxes when they are due. You might want to use this article about selecting options for processing payroll and payroll taxes, to help you make your decision. As you hire employees, there is paperwork you and they must complete. Each new employee must have new hire forms signed and placed in a specific file. To help you set up payroll, here's a checklist of tasks that must be completed and decisions that must be made about how you will pay employees. Payroll is processed at the end of each payroll period (either weekly, bi-weekly, semi-monthly, or monthly). Calculate the gross pay for the employee, based on whether this person is salaried or hourly. Take deductions for federal income tax (withholding), Social Security and Medicare pay deductions, state withholding, and other deductions agreed to by the employee. After you have done the paycheck calculations and prepared a paycheck for each employee, you have some other tasks to complete before the payroll process for that pay period is complete. 1. You must calculate the amount you will owe for both the employer and employee portions of FICA taxes (Social Security and Medicare) and set aside an amount equal to both the employee and employer portions of these taxes, to be paid later, through payroll tax deposits. 2. You must total all the withholding for all employees and set aside this total to be paid later, through payroll tax deposits. the amounts you owe as an employer for Social Security and Medicare. You can make your payroll tax deposit payments using the IRS electronic filing system (EFTPS). Make payments for federal unemployment tax on a regular basis. Make payroll tax deposits to your state, and possibly your locality in addition to federal payroll tax deposits. Submit a quarterly report to the IRS on Form 941 showing the amount of your payroll tax liability and the amounts you have paid on this liability during the previous quarter. Submit an annual unemployment tax report on Form 944 to the IRS showing the amount of your unemployment tax liability and the amounts you have paid on this liability. Submit other state unemployment and worker's compensation reports. To make sure you don't miss any payroll tax payments or reports, set up a payroll tax calendar.